We worked with Christine Knott, the Managing Director at Beyond the Box, to produce eleven language tips to help boost customer satisfaction. How many times have you seen a sign that says “Don’t touch, wet paint”, and how often have you found yourself touching the item? That’s just human nature, because when we hear or see an instruction, we process the verb first and act on it without thinking. This principle can be applied to the contact centre. If an advisor were to say, “I wouldn’t go for that offer…”, the customer will immediately start to be drawn towards it. They will question the reasoning behind their statement and the conversation will go down a negative route. At this point, a deviation has occurred which adds time to the call. It is so much easier to use the verb positively and say what you want people to do. So, rather than a sign saying “Don’t touch, wet paint”, it’s better written “Keep clear, wet paint”. 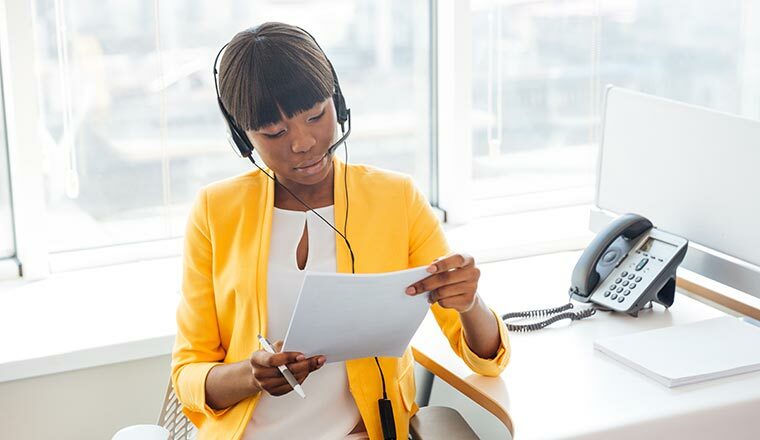 In the contact centre, rather than saying “I wouldn’t go for that offer”, for example, it’s better to say, “we have some better offers”, or “if you stay with this offer…”. This will allow the introduction of a better offer or the promotion of the offer that they believe works best for that customer. So, if an advisor wants to say “don’t X”, try saying “Y” instead, just like in the examples below. A current favourite is “absolutely”, which may sound like a strong alternative to yes, but it can instead come across as false. “Absolutely” is a one-stop word overused in conversation, which, after a while, becomes irritating to the listener. After all, if an advisor were talking to a friend or colleague, they wouldn’t necessarily use “absolutely” instead of “yes”. So why is it a generally accepted word in the contact centre? If an advisor were talking to a friend or colleague, they wouldn’t necessarily use “absolutely” instead of “yes”. So why is it a generally accepted word in the contact centre? Instead, try to use much shorter alternatives, which keep the conversation direct and varied: yes, quite, of course, it can. It does. “Obviously” is another over-used word. Far too frequently, when explaining something or stating a fact, advisors use the word “obviously”. Well, it might not be obvious to the person listening and they might feel demeaned because a throwaway word, used out of context, has made them feel uncomfortable. “It’s like”, is another over-used term that is increasingly annoying to the listener when the subject being discussed is not based around a comparison or likeness to something. Keep the conversation focused and avoid fill-in words/phrases that add little or nothing to the discussion. There are many subtle power words that can be used in customer service, such as imagine, discover, guaranteed, safe, free, new, and proven. These can all deliver results in terms of making the customer feel good about the product/service that is being offered to them. Many of the power words that are highlighted above are used regularly to promote and market products. Take a look at some magazine adverts and see how many you can find! Using the future tense can be a powerful language tool, for example in phrases such as: “you’ll look forward to”, “you’ll love the experience”, and “imagine using it now and enjoying the benefits”. Say “you’ll” as opposed to “you will”. “You will” can be heard as an instruction and may be received less positively than “you’ll”, which is softer and more endearing. Future pacing, especially when used with the word ‘imagine’, helps the customer look into the future and start to anticipate the experience and associate this good feeling with the company. A tip when future pacing is to say “you’ll” as opposed to “you will”. “You will” can be heard as an instruction and may be received less positively than “you’ll”, which is softer and more endearing. If you are in a meeting and the leader says: “It’s going to get more difficult after lunch”, would you still be keen to come back after lunch? The same principle applies when an advisor takes the customer through a procedure on the phone. After all, it might not be difficult to understand for everyone, but when we hear the word ‘difficult’ some people might reduce their listening potential. The word ‘interesting’ naturally increases our listening potential. Over-apologising can make things worse. Offer an apology and then move straight onto the fix. Don’t apologise over and over again. By repeating the apology, the advisor will continuously put themselves on the back foot in the conversation. Also, over-apologising will just compound the mistake. The customer wants to “move away” from the frustration, which may be associated with the error, and “move towards” the feeling of relief that may be found after the query is solved. However, the apology that is given must be sincere. When the customer hears “I’m sorry you feel that way”, it just puts the problem back onto the customer. Take ownership. A phrase that many customers dislike hearing is “you said”. In some contexts it can sound as though the advisor is passing blame on to the customer. Also, if the advisor were to quote back exactly what the customer has said, it makes the caller feel accountable for each single word and takes the “flow” out of the conversation. So, it’s better to say, “we previously spoke about” and paraphrase back to the customer, to help to lessen the accusatory tone. Using “we”, as in the advisor and the customer, instead of “you”, is a good way of strengthening the notion that it is a team effort, as the advisor is showing that they are taking ownership of the query. Easy flowing conversation is powerful and supports rapport building. Yet, sometimes it’s easy to get carried away and move the conversation in a different direction. Some customers enjoy such interactions, but some find it frustrating and annoying. When they do, keep small talk for the occasions when information has to be sought on the system. In such circumstances, it’s always better to ask questions of the customer and stay focused on them. This removes the need to bombard customers with information which they have not asked for. So advisors should be asked to read the signs the customer gives in their responses and if they reply in short answers, or try to bring the conversation back on track, take heed! Time is precious for you, and for the customer it is even more so, so it’s best for advisors to keep focused. Use pull communication – where the advisor draws information from the customer, to make the best decision for them – instead of push communication. Use pull communication – where the advisor draws information from the customer, to make the best decision for them – instead of push communication – where the advisor pushes information onto the customer so they can choose which option best suits them. By using pull communication, the advisor can keep the conversation focused and work with the customer to make the best decisions for them, while picking up information that can be entered into the CRM system. This information could help the next advisor who speaks with the customer to build rapport. Allowing the customer to finish what they are saying means we hear everything they want to say. Pre-empting by saying “I know what you mean…” before they have finished means we don’t. As such, we might get the wrong message and at the same time annoy the customer. Advisors should also stop making assumptions. This is an easy trap to fall into when a customer fits into a certain bracket, and an advisor may simply conclude that a customer will want the same product/service as a similar customer they are reminded of, even if it may not be the best option for them. An example would be assuming that an elderly customer would prefer to use the phone, just because of their age. However, older customers are now more advanced than ever, and many choose to use email, live chat and messaging apps. There is a technique that is used by appointment-setting advisors called an “alternative” close, which is where the sales advisor offers the prospect customer two dates, so they feel like they have a choice. This helps to lower customer effort – as they don’t have to choose from a great list of dates. This same principle can be applied customer service. Instead of saying “this is the option for you” or listing the options, say “given that you’ve told me… I would suggest that you go for option X or option Y”. It’s good practice to offer the customer one option, as it allows them to have input and make their own decision. It’s also good practice to offer customers a few options rather than many options. This focuses their thoughts and makes it easier for them to decide. So, instead of saying “this is the option for you” or listing the options, say “given that you’ve told me… I would suggest that you go for option X or option Y”. Make suggestions instead of giving what might be interpreted by the customer as a ‘bossy instruction’. For example, instead of saying “you need to…“, say “can I suggest that you…“. This gives an overbearing tone. So, instead of saying “OK?” after every instruction, try saying something along the lines of: “Feel free to stop me at any point if I go through this too quickly”, before giving any instructions. The number one cause for using negative language on the phone is having the wrong mindset. If you help to improve advisor mindsets, it is likely that much of this negative language will naturally fall by the wayside. So, it’s important for contact centres to do what they can in terms of boosting morale and improving motivation while educating advisors about how their mindset can affect their performance. Use team huddles at the start of the day to remind advisors that they can choose their own mindset and challenge any negativity that may start to creep in. Use these huddles, or however else you like to communicate with the team, to ask advisors to focus on how they would like to sound, to take responsibility for their mindset and think about how it can be reframed in a positive way. FatFace’s contact centre in Havant uses huddles to help improve mindsets at 10am every morning. The contact centre gathers the whole team together and they have a discussion, before ending by striking a power pose. In this power pose, advisors are asked to make as big a stance as possible, as the pose is linked with improving mentalities and instilling confidence, as is discussed further in the TED Talk below. Many of the examples of customer service language that we warned against using involved negatives, such as “do not”. So, it seems logical to ban these negative words. However, doing so would hurt the natural flow of the conversation, as advisors are having to think really hard about what they can and can’t say. It may also drive up Average Handling Time (AHT) if advisors are struggling to find ways around saying what they want to say. So, instead of telling the contact centre team “don’t generalise”, “don’t use accusatory words” and “don’t use the future tense in a negative way”, maybe focus on one new point each week. Using huddles, or continuous coaching sessions, focus on one area at a time and teach advisors the better alternatives to use. And if you find that your advisors are often using certain phrases that we have warned against maybe create a simple cheat sheet with the better alternatives that we recommended. While these eleven points have certainly left a lot to be remembered, here is a handy table of words and phrases that we’ve advised against throughout this article and a set of better alternatives. OK? (after every instruction) Did you answer all the points in order of importance to the customer? Does Body Language Really Matter When Talking on the Telephone? Want to Speak in the Same Language as the Customer? Use Filtering!